Posted on March 30, 2018 September 4, 2018 AuthorMark McLaughlin M.D. 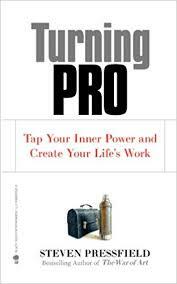 This is a personal review of Steven Pressfield’s Turning Pro: Tap Your Inner Power and Create Your Life’s Work. When reading a book and encountering an interesting idea, I habitually dog-ear the page. If it’s a particularly strong passage I’ll dog-ear the bottom corner as well. If it’s a profound reflection-something that truly speaks to me, I will actually dog-ear the dog ear! Of all the books in my library, Steve Pressfield’s books have the most double dog ears! Why do I find his books so provocative? They call to me like Santiago’s inner voice in The Alchemist. They inspire me to keep searching for a better me. They make me realize that there is still a hell of a lot I don’t know about myself and the world. It’s a secret play book that is helping me elevate my game from amateur to pro. He speaks of the upper realm and a lower realm. Here’s how Pressfield describes it in one of his blogs. “What is the pain of being human? To me, it’s the condition of being suspended between two worlds and being unable to fully enter into either. We can’t reach the upper realm (that belongs to the gods) but we can’t forget it either; we can’t escape intimations and half-memories of … what? Some prior sojourn, before birth perhaps, among the immortals or the stars. I’ll bet you know what I’m talking about. Like that day you could do no wrong. Like that photo you shot, song you sang, painting you painted. Like that game that came perfectly together for a magical moment of performance, like that story you wrote or read that made you cry when you finished it. That’s when life is the sweetest. Why can’t we have more of those glimpses of the upper realm? One of my teachers once said that perhaps there are no real tears of joy. He proposed that the tears we shed in those incredibly powerful moments are tears not joyful, but of regret and remorse because instantaneously we realize that more of our life could have been like the moment that was just experienced. How can we achieve this feeling more often? How can we glimpse the world of the gods with more frequency, even regularity? I’m not sure, but I believe one clue is through mastering Mr. Pressfield’s axioms.